Submitted by via NAWT Cornwa... on Thu, 11/04/2019 - 00:00. 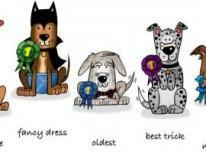 NAWT are holding a Fun Dog Show, with rosettes 1st - 5th place, goodie bags for 1st place winners and trophies for Reserve and Best in Show and Best Rescue, at Hayle Recreation Ground. There'll also be food and refreshments available along with stalls selling a variety of items!